There are times when decisions need to be made with many more people in mind other than myself. Okay, probably all the time… Anyway, having been away the previous weekend for a funeral on the east coast, I made the decision to skip the COSMIC race at Monarch and spend the weekend with my family. As much as I wanted to race, it was important to me to spend quality time with my husband and kids. Thanks to my parents, Ian and I were able to skin and ski together on Saturday while Juniper enjoyed ski school. With amazing weather all weekend, I made an early trip to Marble on Sunday morning so I could get home early to hang with kids and for Ian to get out for a road ride. 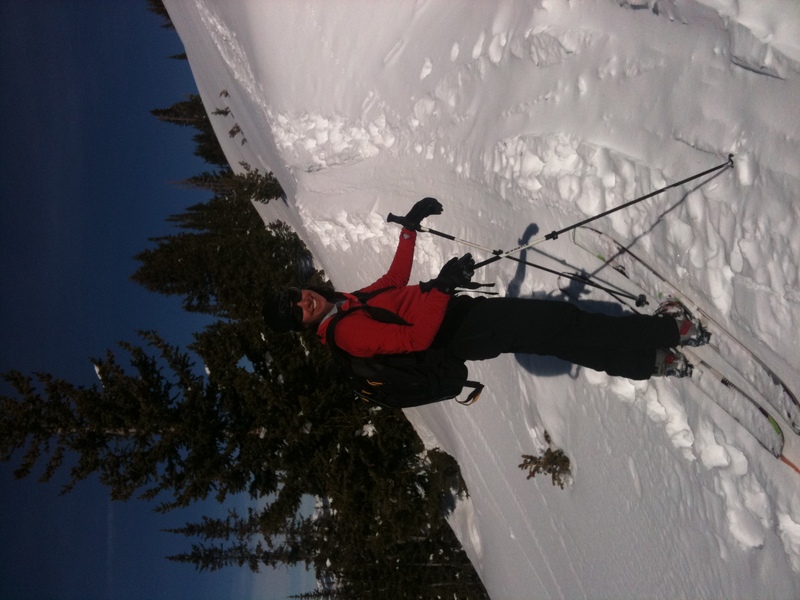 I tested a pair of Black Diamond skis from next year’s quiver and enjoyed a great day of skinning and skiing. Despite first thinking I was sacrificing my race, I quickly realized it was the best decision to enjoy my backyard and family. My brother and his family arrived yesterday so now it’s time to play on the skis for a few days. 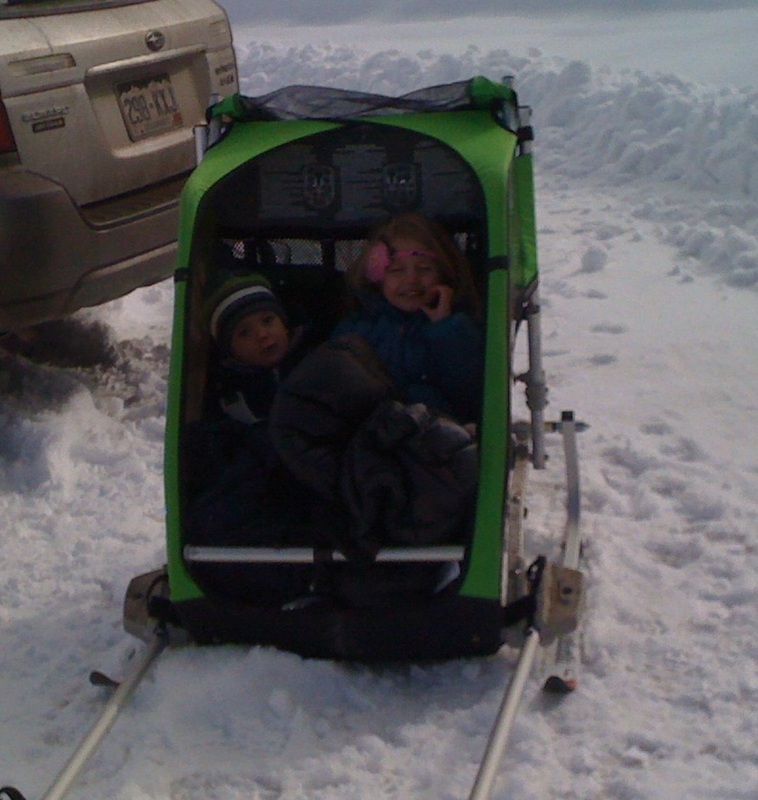 Before riding the chairlift, I made it out this afternoon for some interval training with the kids. I have only towed both kids skate skiing once before, but with my new ski set-up for the Chariot I set out for some skinning up Marion Gulch. Even though I was breaking trail through about 6 – 8″ of fresh snow, the trail was the perfect pitch for my power intervals. Rushing out the door as usual, I forgot my Garmin GPS watch and was forced to make some adjustments to my plan. Thankfully I had remembered my phone so I timed one minute at an all out pace and marked the beginning and end in the snow. I continued my fifteen intervals by making hash marks in the snow at the end of each one to make sure I didn’t slack at all. Once I had sufficiently packed down the trail in the small area, I continued up the trail to the top. The La Sportiva Stratos carbon boots and skis continued to impress me. Any other ski mountaineering gear would have felt too heavy for the terrain, but the featherlight weight of the gear made it super comfortable and well suited. Add a pair of Pomoca skins and sleeping kids and everything was perfect. Also, this is the week I had hoped to go to the ISMF Ski Mountaineering World Championships in Claut, Italy. Check out the new La Sportiva blog to follow fellow Sportiva teammates Luke Nelson and Janelle Smiley.